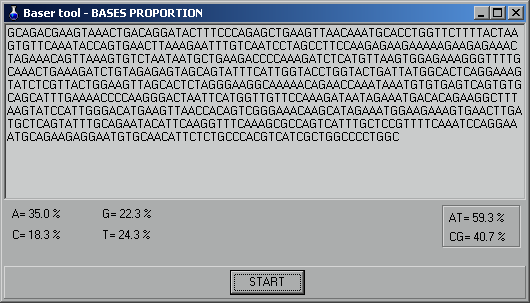 www.dnabaser.com This tool will show the proportions between nucleotides in a DNA sequence. You don't need to install it or unpack it. Just download the program and double click to run it. Other software by Heracle BioSoft: DNA Baser is an affordable alternative for assembly of DNA sequences and generation of contigs. File formats supported are abi, scf and seq (or FASTA). Chromatograms of the assembled sequences are displayed in a synchronized format with the generated contig. Ambiguous bases in the contig are highlighted and corrections are suggested by DNABaser based on Quality Values of the trace files. Minimum input from the user required. Editing of ambiguous bases, including insertion and deletion, is possible. The settings of the assembly engine can be adjusted by the user. The user can personalize the appearance of chromatograms, nucleotides, background. The Quality Values of the trace files are displayed above chromatograms, so that the user can easily decide on the corrections in the final contig. Original chromatogram files are automatically trimmed based on Quality Values. The contig is automatically saved in FASTA format, in the same directory with the original trace files. By using a built-up database of primer and vector sequences, that can be edited/upgraded by the user, DNABaser can be set to automatically trim the vector sequence out of the final contig. The affordable price is another important feature of DNABaser, at only 490 USD per single license; significant discounts are offered for institutions that order several licenses of DNABaser (see our pricing policy on our web pages). Using warez version, crack, warez passwords, patches, serial numbers, registration codes, key generator, pirate key, keymaker or keygen for DNA Counter 1.1 license key is illegal and prevent future development of DNA Counter 1.1. Download links are directly from our mirrors or publisher's website, DNA Counter 1.1 torrent files or shared files from free file sharing and free upload services, including Rapidshare, HellShare, HotFile, FileServe, MegaUpload, YouSendIt, SendSpace, DepositFiles, Letitbit, MailBigFile, DropSend, MediaMax, LeapFile, zUpload, MyOtherDrive, DivShare or MediaFire, are not allowed! Your computer will be at risk getting infected with spyware, adware, viruses, worms, trojan horses, dialers, etc while you are searching and browsing these illegal sites which distribute a so called keygen, key generator, pirate key, serial number, warez full version or crack for DNA Counter 1.1 download. These infections might corrupt your computer installation or breach your privacy. A keygen or key generator might contain a trojan horse opening a backdoor on your computer. Hackers can use this backdoor to take control of your computer, copy data from your computer or to use your computer to distribute viruses and spam to other people.